How Much is my Home Worth in Queens Park? The median price for a house in Queens Park, Perth on August 28, 2017 was $423,000. The median price for a unit was $342,500. The 12 month capital growth has fallen for both houses and units to -7.66% and -6.82% respectively. The average annual capital growth for houses is 2.21% and 1.06% for units. 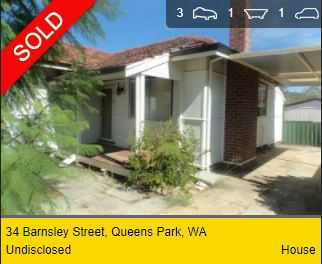 There has been 59 houses and 5 units sold in Queens Park this year. The demand to supply ratio has houses as balanced and units as above average. A balanced rating says that there are an equal amount of buyers and sellers. This is a closely fought battle and both parties need to be flexible. A rating of above average says there are more buyers than sellers but only just. Sellers are generally getting the price they are advertising. Expect capital growth to be ahead of the national average. Are you thinking of selling your home in Queens Park? Or, maybe you just want to know how much your property is worth? Our sales agent perform free property appraisals on land, units, apartments and houses. Our findings are based on recent sales history, location to shops, public transport and schools. We have sold hundreds of properties in the area and we will give you an accurate price valuation of your home. Do you own an investment property that needs a manager? Or, are you thinking of renting out your current home? Our property management team provide free rental appraisals on units, apartments and houses. We like to meet with the owner to discuss the length of the lease and the type of tenant they prefer. Our job is to maximise the landlords return on investment. We have a number of people interested in renting real estate in Queens Park. This can save time and money when advertising the property for rent. Plus, all the potential tenants on our books have already been security checked. Our property managers use the latest software to help administer each rental. Our software automatically alerts us to rent collection failures, when to do our routine inspections and many other tasks. We provide all our landlords with full taxation accounting files. Prior to any maintenance issues we will contact the owner first unless emergency work needs to be carried out by law. Browse our list of recently sold property. POTENTIAL DEVELOPMENT BLOCK! Be quick, this won't last the week!